EmpowerID is an award-winning and all-in-one suite of identity management and cloud security solutions which makes it easy for companies, organizations, and businesses in healthcare, banking and finance, government, and nonprofit industries to manage identities across cloud-based and on-premise environments. With EmpowerID, users will be able to seamlessly and securely connect their employees, partners, and customers to applications, services, and workflows; helping them optimize the flow of their key processes. EmpowerID provides an identity solution that allows users to easily handle the entire lifecycle of employee identities, covering provisioning access for new employees, configuring access when employees change roles or job assignments, and revoking their access if they are no longer affiliated with the organization. Aside from streamlining employee identity lifecycle management, the solution also makes sure that employees are able to access applications and networks without the need to use multiple usernames and passwords. Moreover, EmpowerID enables IT admins to centrally manage users, applications, and privileges all from a single area. The identity management and cloud security suite also provides companies with the capability to handle partner identities and access privileges so they can smoothly collaborate with their partners and become competitive in the digital market. The admins of their partners can request access for applications in a way that is similar to shopping items or products on eCommerce websites. EmpowerID can also be used to deliver personalized customer experiences. The platform can unify customer identities across fragmented heterogeneous systems and build enterprise-wide customer profiles, allowing sales and support teams to fully recognize and understand their customers and serve them based on their own needs and preferences. App developers can extend the identity and access management functionalities and capabilities of EmpowerID to the applications that they are building through the aid of its user-friendly API. They can even embed out-of-the-box identity and access management workflows into their own web portal. The platform has a built-in multi-tenant authorization engine that permits users to perform role-based checks and create access and security policies that define who can login and access specific portions of their applications. Among the prominent features of EmpowerID is that it allows users to streamline all aspects of employee identity lifecycle management. From the moment employees start their first day at work until the time they leave the company or organization, everything related to their identity and access is handled automatically. Thus, users can automatically provision their access, adjust it in case they shift to another job function, and disable their logins and revoke their access once they are no longer working in the organization. To be able to maximize ROI, organizations must ensure that their employees are always productive and can focus on the tasks assigned to them. One factor that affects employee productivity is the time-consuming and cumbersome process of using multiple usernames and passwords to log into applications that are critical to the operations of the company or business. 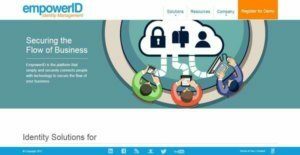 In EmpowerID, employees no longer have to go through this process, as the solution enables them to quickly login and access their applications, networks, and digital resources with just a single login information. There is a very unique feature included in EmpowerID that changes how access request processes are usually implemented. The platform has a shopping cart functionality that allows employees and other users to request access for applications and resources by simply looking for applications, folders, SharePoint sites, and resources that they don’t currently have access to, dropping them in the cart, and sending an access request. It’s like shopping online, and users will surely enjoy such experience. After users are done shopping for applications and resources they want to get access to, a workflow engine then performs its task. The workflow engine checks the organizational hierarchy and the access policies that have been set up and identify the items in the cart that need approval. If the items require approval, the workflow will automatically determine how many approval steps those items need to go through and who are the persons in charge for all the approvals. Then, it instantly routes the access request to the right approval workflows and authorities. Identity and access governance and administration is a complicated process, especially if IT admins have to deal with a lot of access and security policies and administration interfaces that are scattered over multiple disparate systems. As a result, compliance and audit activities are very hard to execute. With EmpowerID, identity and access governance and administration can be performed on a single spot, thereby centralizing compliance and audit activities. It permits IT admins to easily provision and de-provision access, and manage applications, users, and access privileges in a central interface which they can access on desktop computers and mobile devices. Partners play a major role in boosting the performance of an organization or business, and users must be able to collaborate with them smoothly. EmpowerID’s identity and access management capabilities can also be extended to partners, allowing users to rapidly register new partners, grant new access to existing ones, and enable single sign-on in the applications that their partners are using. EmpowerID gives users full control over the partner experience. Thus, they can define how their partners must log in, which registration pages they will be directed into, and what workflows they can run. They can customize and configure all of these so that their partners can have a positive experience as they relate and interact with the organization. The platform makes sure that organizations are able to enhance security, and at the same time, reduce the costs associated with managing the identities of their partners. This is made possible through its multi-tenant security system the applies security controls based on roles and attributes. This advanced and role and attribute-based multi-tenant security system helps them specify what their partners can view and do. Also, the platform offers self-service capabilities to partner admins, letting them independently manage the identities and access privileges within their own organization. This helps users reduce IT and administration, and partner management costs. EmpowerID is also designed to assist users in delivering a personalized and convenient customer experience. With EmpowerID, they will be able to implement a one-click access solution which enables their customers to log into the company’s back-end applications using their social media logins like those ones they are using to log into Facebook, Twitter, or Google Cloud Platform. In addition, with a just a single login information, customers will be able to log into the company’s systems and access web and mobile applications and their contents from any device and any location. This doesn’t only speed up the login process but also provides customers with a personalized experience, as they are able to log in and access applications and contents from their favorite devices. EmpowerID is a developer-friendly identity management platform. In fact, it enables app developers to build applications that leverage the identity and access management functionalities and capabilities being delivered by the platform. Everything they need is already provided such as an identity warehouse, social media login/registration, multi-factor authentication, and self-service interfaces and workflows. They can enable all of these for their applications through the aid of EmpowerID’s user-friendly API. This way, they will be able to build powerful applications and market them much faster. If you are interested in EmpowerID it could also be beneficial to investigate other subcategories of Best Identity Management Software listed in our base of SaaS software reviews. Since each company has specific business needs, it is advisable for them to desist from searching for a one-size-fits-all perfect software solution. Needless to say, it would be pointless to try to find such a platform even among widely used software platforms. The clever thing to do would be to catalog the various vital aspects that need consideration such as key features, budget, skill levels of workers, company size etc. Then, you should do your groundwork thoroughly. Read some EmpowerID reviews and investigate each of the other apps in your shortlist in detail. Such comprehensive homework can ensure you discard ill-fitting applications and zero in on the system that presents all the aspects you need for business success. How Much Does EmpowerID Cost? We realize that when you make a decision to buy Identity Management Software it’s important not only to see how experts evaluate it in their reviews, but also to find out if the real people and companies that buy it are actually satisfied with the product. That’s why we’ve created our behavior-based Customer Satisfaction Algorithm™ that gathers customer reviews, comments and EmpowerID reviews across a wide range of social media sites. The data is then presented in an easy to digest form showing how many people had positive and negative experience with EmpowerID. With that information at hand you should be equipped to make an informed buying decision that you won’t regret. What are EmpowerID pricing details? What integrations are available for EmpowerID? If you need more information about EmpowerID or you simply have a question let us know what you need and we’ll forward your request directly to the vendor.